This fall, super scarves are the latest trend. These extra long and extra wide scarves offer many styling options and can also be worn as rectangular shawls. This post contains affiliate links. Yarn for the sample was generously provided by Knit Picks. I’ve been teaching crochet for about 9 years and most beginner students list a scarf as the project they want to make first. While making a scarf as a first project is too repetitive for some, for the dedicated beginner, it can provide an opportunity to practice stitches over and over until they are mastered. I designed this scarf with a dedicated beginner (or, a devoted streaming tv fan) in mind. 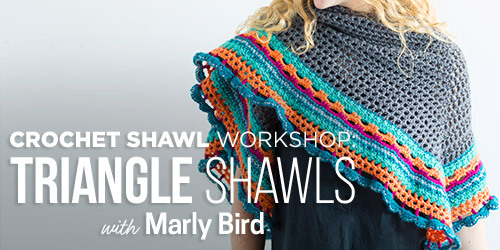 After the edging rows, you will do lots and lots (and lots — it’s a super scarf, after all!) of repeats of the pattern. But, you’ll get a fabulous (and reversible) unisex mock bobble texture without having to actually make bobbles. If you make your own A Beginner’s Super Scarf, I’d love to see it! Share your progress and questions by tagging me on Facebook as @Underground Crafter, Instragram as @ucrafter, Google+ as +UndergroundCrafter, or Twitter as @ucrafter. Add A Beginner’s Super Scarf to your Ravelry favorites or queue. This easy mock bobble stitch creates a reversible texture. The wide, long unisex super scarf is guaranteed to keep you warm while offering an array of styling options. Get the matching A Beginner’s Textured Hat pattern here. Adult: 8” (20.5 cm) wide x 74” (188 cm) long. Knit Picks Swish Worsted (100% Merino wool, 1.75 oz/50 g/110 yd/101 m) – 8 skeins in Rainforest Heather, or approximately 880 yd (805 m) in any medium weight yarn. 14 sts x 12 rows in pattern = 4” (10 cm). Exact gauge is not critical for this pattern. Ch 32 or any even number of sts. Row 2: Turn, ch 1, sc in same st, *ch 1, sk 1 st, sc in next st; rep from * across. Row 3: Turn, ch 1, sc in same st, *sc in ch-1 space, sc in next st; rep from * across. Row 4: Turn, ch 1, sc in same st, *tr in next st, sc in next st; rep from * across. Row 5: Turn, ch 4 (counts as tr, here and throughout), *sc in next st, tr in next st; rep from * across. Rep Rows 4 & 5 until scarf measures approximately 73” (185.5 cm) long — or about 1” (2.5 cm) shorter than desired finished length — ending after Row 4. Row 6: Turn, ch 1, sc in same st and each st across. Row 7: Rep Row 2. Row 8: Rep Row 3. Fasten off. © 2016 by Marie Segares (Underground Crafter). This pattern is for personal use only. You may use the pattern to make unlimited items for yourself, for charity, or to give as gifts. You may sell items you personally make by hand from this pattern. Do not violate Marie’s copyright by distributing this pattern or the photos in any form, including but not limited to scanning, photocopying, emailing, or posting on a website or internet discussion group. If you want to share the pattern, point your friends to this link: http://undergroundcrafter.com/blog/2016/09/19/free-pattern-a-beginners-super-scarf. Thanks for supporting indie designers! I’m looking forward to attempting to make this. Wish me well!!!!! !